Children love to get into things and mess around with items that they are not supposed to. It’s human nature to explore everything we set our eyes on and this unfortunately includes electrical outlets. Ever year there are about 3,900 emergency room visits and around 100 deaths revolving around power outlets. 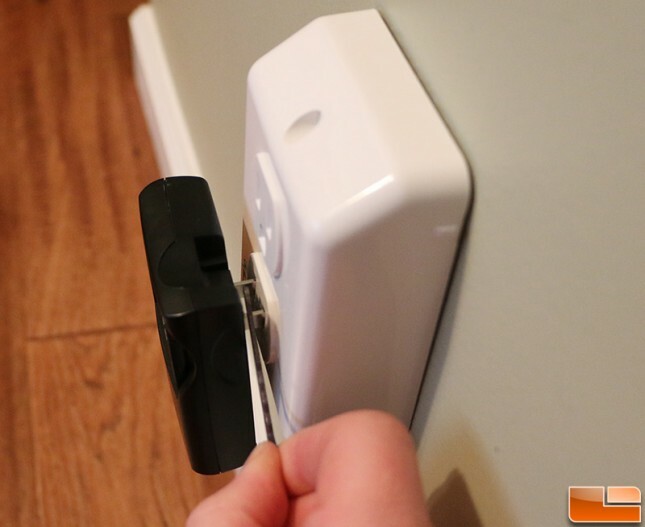 Traditional outlet covers and plugs are inexpensive ways to help prevent electrical shocks, but we all know that most kids can easily remove plastic inserted in a matter of seconds and what about outlets that are always in use? 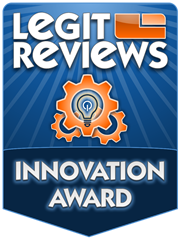 The United States has been making strides to improve this situation with tamper-resistant code requirements. Today 46 of the 50 states have adopted the National Electrical Code (NEC) requirement of tamper-resistant receptacles in new home construction. This is great if you have a new home, but there are millions of homes out there that have no protection at all. This is where a new product called the Guardian Angel Safety Outlet comes in. The Guardian Angel Outlet is an electric outlet that provides what is said to be absolute safety along with the convenience one expects from a normal outlet. The Guardian Angel Outlet is always on and uses capacitive sensing to continuously monitor the electrical receptacle’s immediate surroundings for dangerous actions or situations – ensuring a child is always safe. The Guardian Angel Safety Outlet took over five years to bring to market and comes as a 2 pack for $39.00 plus $4.99 shipping on Amazon. This puts the cost per outlet box at $22, which is obviously much higher than a 12-pack of outlet plugs that runs $2.99 ($0.50 per outlet). Let’s take a closer look at the Guardian Angel Outlet and see what you get. The Guardian Angel Outlet is a simple device that simply plugs in and then is screwed to your existing 15-Amp wall outlet panel. 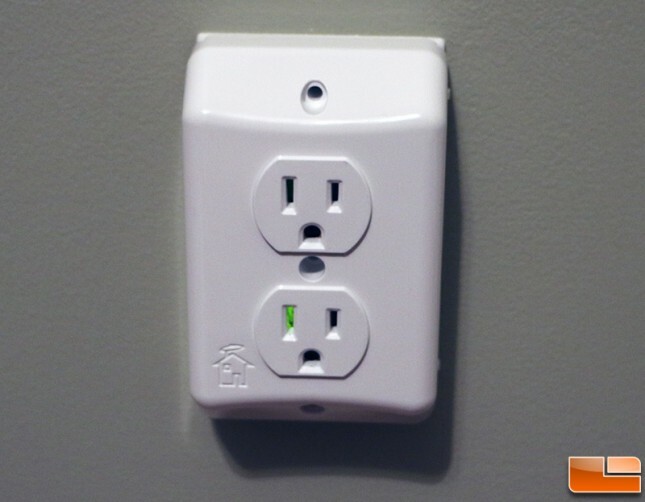 To do this all you need to do is remove your existing wall plate and then plug in the Guardian Angel Outlet and secure it with either the center screw or the two included end screws. 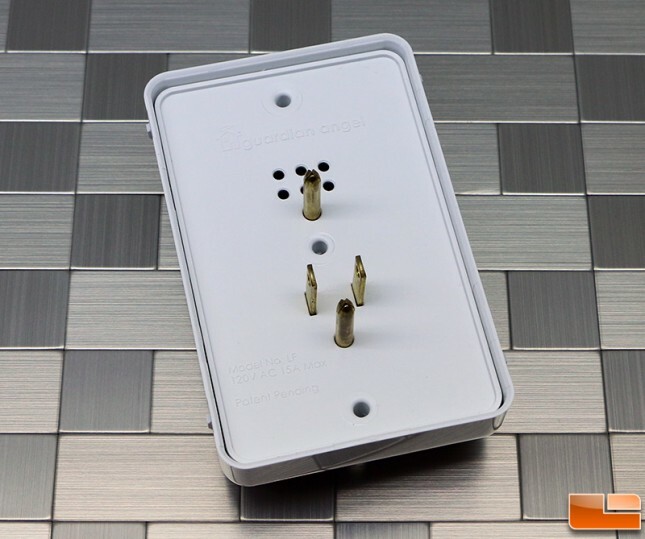 Your outlet box will determine if one or two screws is needed. Installation can be done in seconds with a simple screwdriver and a professional electrician is not needed. Guardian Angel currently does not have plans to make a 20A version of this outlet cover, but is planning on introducing a wire-in version in the years ahead. Here is a look at the back of the Guardian Angel Outlet. The housing for the safety outlet is sonic welded together at the three mounting holes, which means you can’t take it apart without breaking it. There should be no reason to take this outlet apart and you want it to stay together to prevent electrical shocks. Legit Reviews spoke with Dan Masterson, founder and CEO of Guardian Angel Enterprises, who was able to furnish us with some images of the inside of the Guardian Angel Outlet. In the gallery above you can see some images of one of the prototypes. If you look at the images closely you can see that there is a raised piece of copper above the power contact points that make up the capacitive sensors above each outlet. 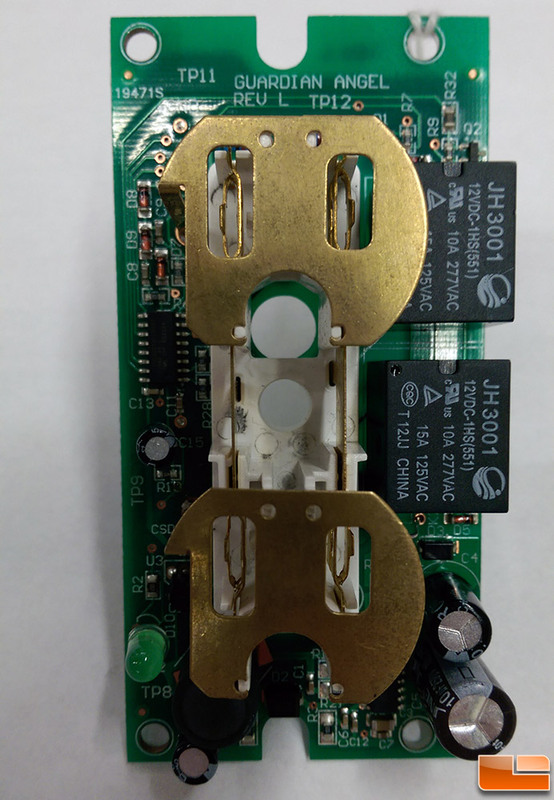 This design means that the sensors are located at the face of each outlet and should sense a conductive object about 0.25-inches away from the sensors. 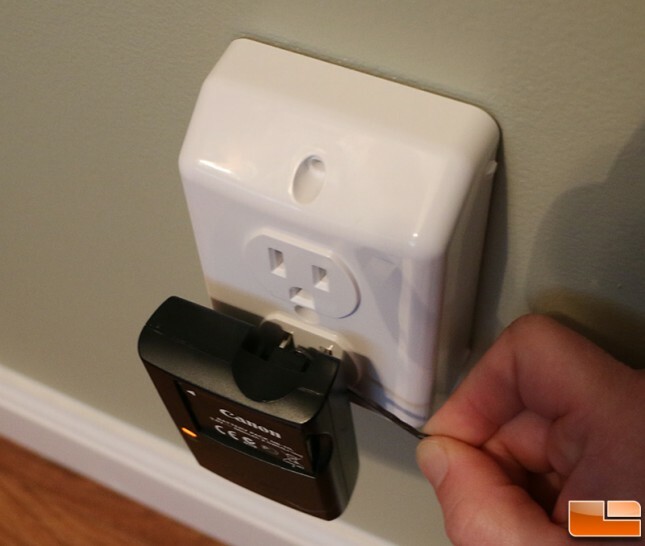 Note that Guardian Angel Outlet is not a surge suppressor and will not protect against a power surge. 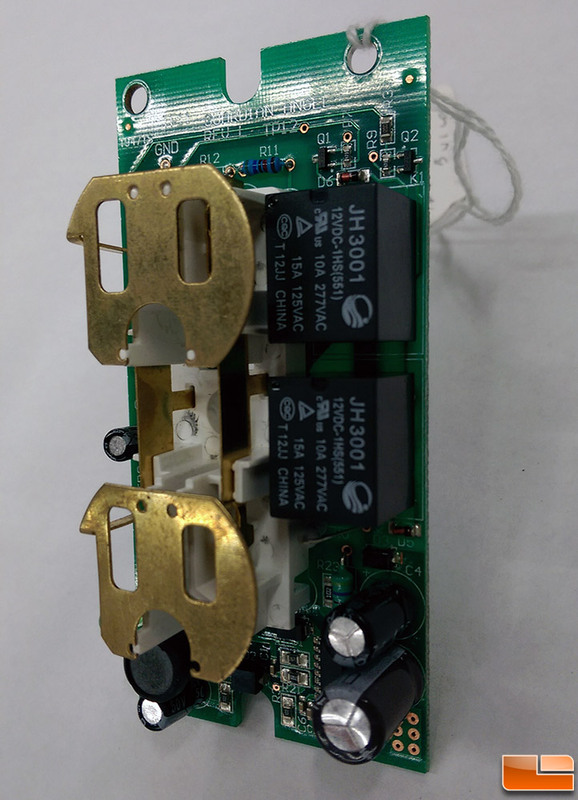 The PCB layout and solder job were good and we noticed that standard consumer grade electrolytic capacitors along with a pair of Omron JH3001 12VDC-1HS power relays were being used. We did notice electrical whine or a humming when the Guardian Angel Outlet was installed. 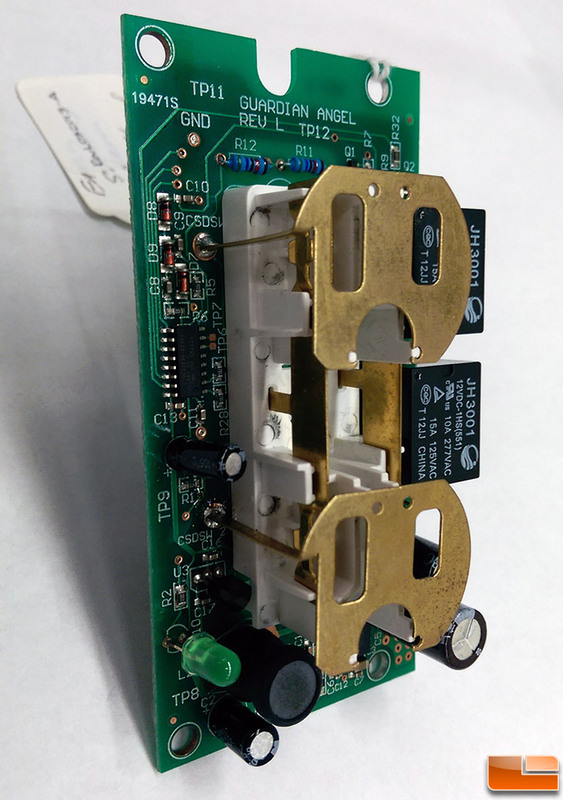 Mr. Materson let us know that the JH3001 relay was the culprit and that it is no longer being used on production models due to the unintended noise from the relay. 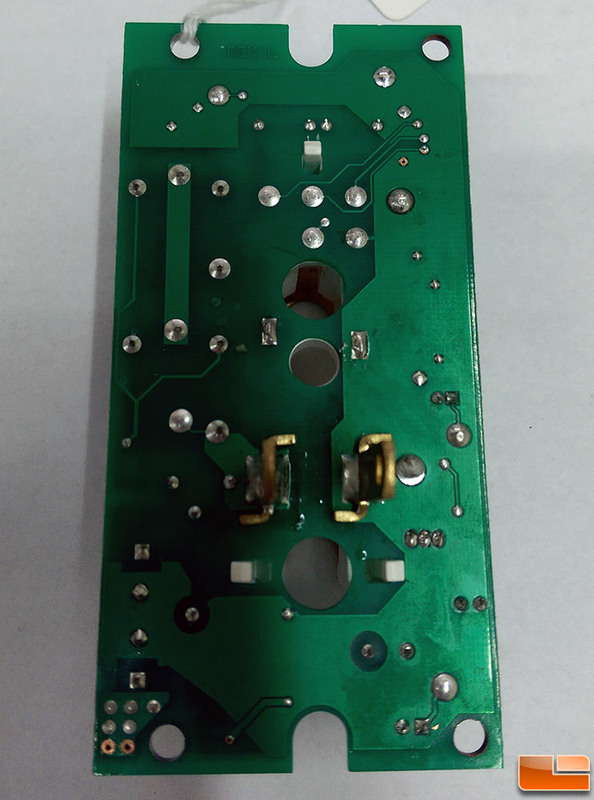 We are expecting to receive new samples that have a different relay to confirm that this issue has been resolved. We tested the Guardian Angel Outlet in our home at various outlets and found that it worked as advertised for the most part. As soon as you reach for a plug or get within 1/4 inch of the electrode the switch would disable. As soon as you move away the electricity returns to the outlet. In the image above you can see that there is a green LED light on the bottom outlet that indicates that the power is on. There is an optional decorative faceplate that one can purchase although we were not sent that cover. When you put something like a hairpin, which just happens to be the most inserted object by children, near the outlet it shuts off before you can make contact with the face plate let alone insert it into one of the holes. You’ll be able to hear an audible click when the circuit is disengaged. This means that you get 100% shockproof protection from the outlet when it detects something conductive is within a quarter inch. Note that you only get 100% shockproof protection from the outlet when it detects something conductive is within a quarter inch. We tinkered around with the outlet for a few minutes and found a way to electrocute ourselves at will. Basically we were able to take an object that was plugged into the Guardian Angel Outlet and pull it out to the very end then touch the live prongs with a hairpin. Here is a side view to show where we were touching. As you can see the capacitive sensor does not ‘sense’ out far enough to detect what is going on when something is very loosely installed into the outlet. The Guardian Angel Outlet is a great product that was designed to save lives and create a safer world, but it is not the perfect end-all solution due to this finding. 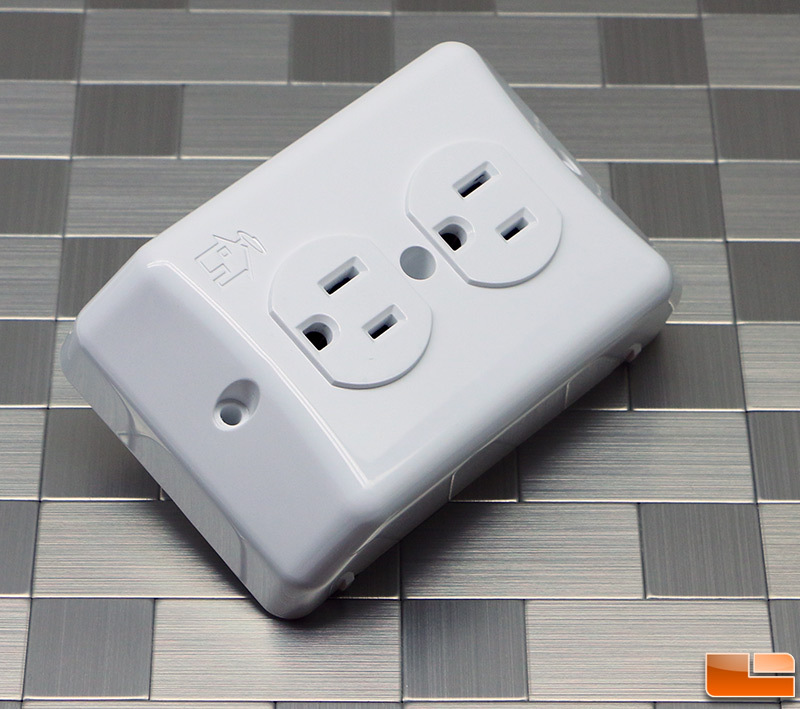 The Guardian Angel Outlet helps reduce the risk of being shocked by an electrical outlet. Every single day both adults and children get zapped by power outlets and it can lead to serious injury. The Guardian Angel Outlet was designed to be a better outlet and we agree that it does improve upon the current solutions on the market today. Outlet plugs, outlet covers and tamper-resistant outlets are all better than nothing, but do little to prevent shock when they are circumvented. The Guardian Angel Outlet successfully cut the power to the outlets before we could get zapped 99% of the time. We could figure out a scenario where we could pull a plug out to the very edge of having power and then getting a hairpin in to short the circuit, but the odds of that happening is very slim. If the folks behind the Guardian Angel Outlet could increase the range of the capacitive sensor they really would have a shockproof design. When writing this review we noticed that many early articles about this outlet called it the Guardian Angel Shockproof Outlet, but recently many have been calling it the Guardian Angel Safety Outlet. It looks like there has been a branding shift, although the retail packaging still calls it shockproof. When it comes to safety it has been found in studies that children see the two slots on top and hole in the bottom as a face. Kids are drawn to outlets and the fact that the shape of an outlet resembles a face doesn’t help matters at all. In recent years most states have taken strides to improve outlet safety in new homes and businesses. Some electricians even install outlets up-side down as children don’t see the plugs as a face. Although all the electricians I know do it like that in the event that something falls a partially plugged in device that it will land on the exposed ground plug and roll off safely to the floor versus landing across the live positive and neutral prongs. The Guardian Angel Safety Outlet takes a new high-tech approach at solving a worldwide issue and we like that. At the end of the day it all comes down to pricing and how well something works. 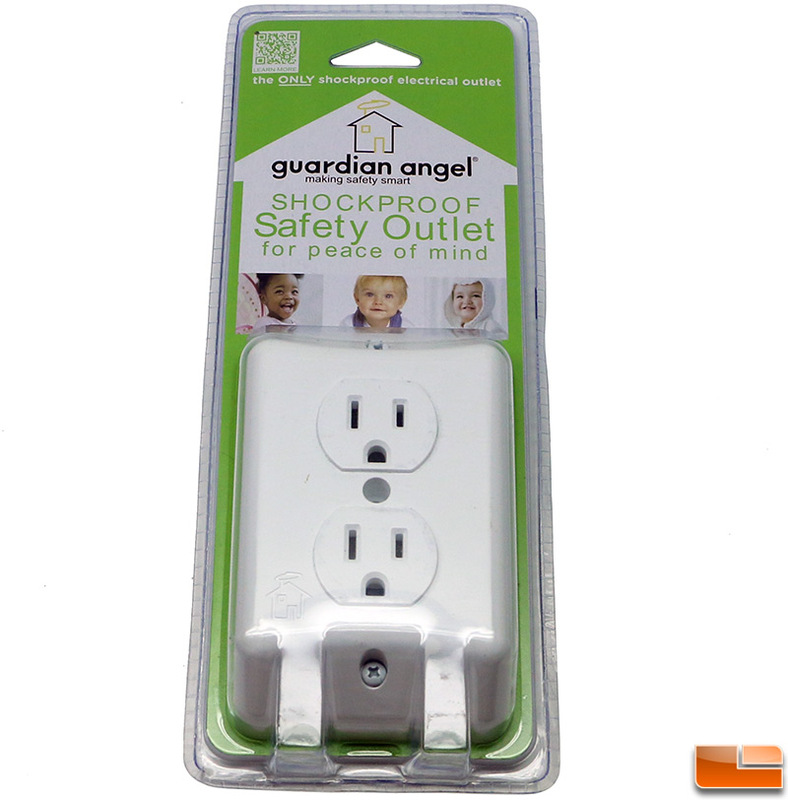 The Guardian Angel Safety Outlet comes as a 2 pack for $39.00 plus $4.99 shipping on Amazon. 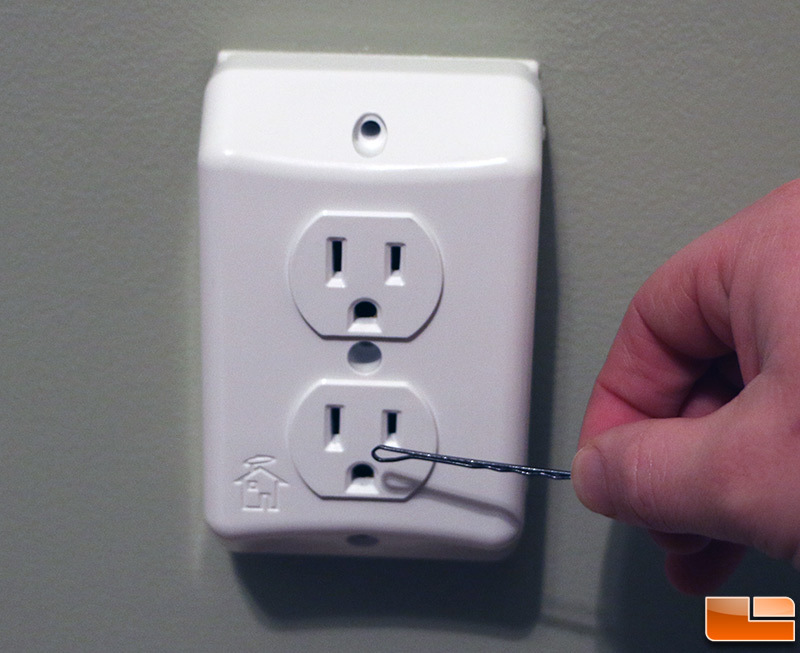 A typical wired-in 15A tamper-resistant duplex outlet runs $1.19 at your local Home Depot. It doesn’t make financial sense to use the Guardian Angel Outlet on every power box in your home, but it wouldn’t be a bad idea to pick them up for the outlets that are always in use. Many homes in America have nightlights, paper shredders, lamps and other items that are constantly left plugged in. By installing the Guardian Angel Outlet on those wall boxes it will give you the peace of mind that your child or even a senior citizen won’t get zapped. Legit Bottom Line: The Guardian Angel Outlet uses capacitive sensor technology to make your home or business safer than ever!